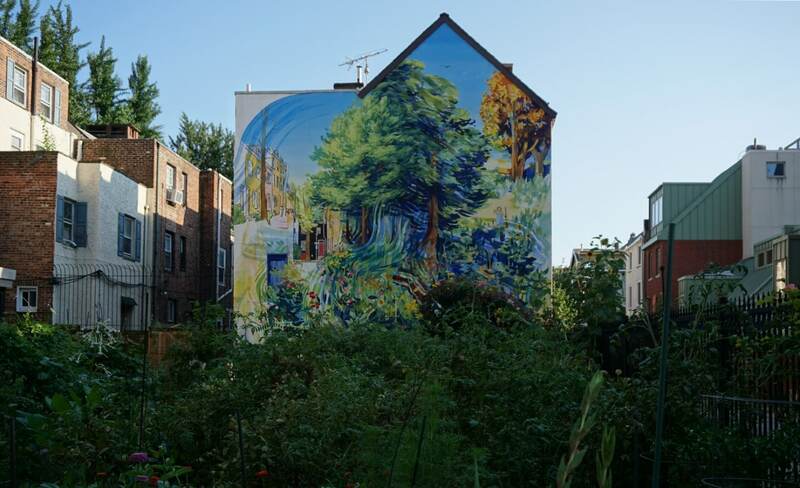 Street art is pretty to look at, but Mural Arts Philadelphia creates artwork that not only transforms the wall it appears on but also changes lives. They have the largest collection of collaborative artwork in the world – there are over 4100 pieces! It can be a little overwhelming, trying to figure out where to go to see the best Philadelphia street art. Instead of venturing out on our own, we were excited to do the Philadelphia Mural Mile walking tour. That way we could see the best murals and learn some of the stories behind the artwork. Let me tell you more about the powerful street art you can expect to see on this Philadelphia mural tour. Originally Mural Arts started as an anti-graffiti summer program in 1984. They wanted to redirect the talents of the graffiti artists to make art that would beautify the area. This resonated with me, especially after seeing the graffiti on top of some beautiful murals in Bushwick, a neighborhood in Brooklyn, New York. 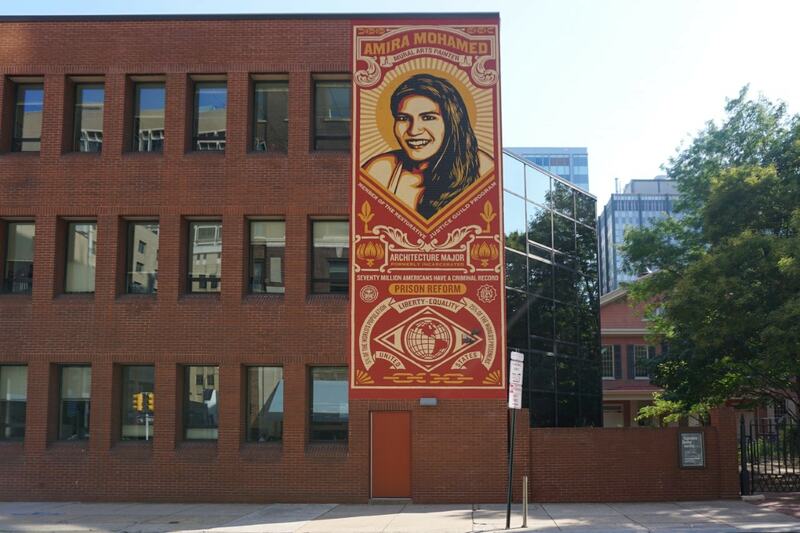 Shepard Fairey, the artist behind Obama’s hope campaign, created this mural of one of the people that the Mural Arts program has helped. The mission has grown to be much more than just an anti-graffiti project though. 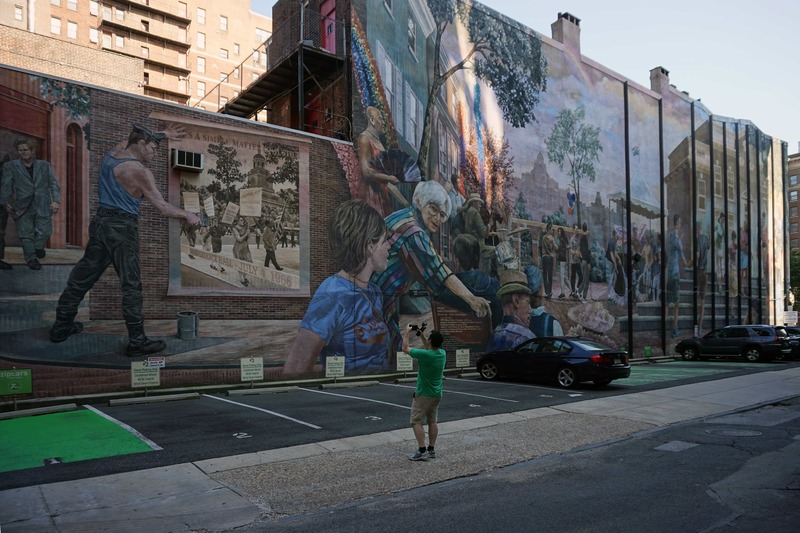 The nonprofit works with communities to create 50–100 new public art projects each year and also does the important job of restoring the older Philadelphia murals in its growing collection. They have helped people with substance abuse issues, those that have been incarcerated, the homeless, and more. The artwork also gets people talking about critical issues facing society. Their Royal Highnesses Charles, the Prince of Wales and his wife, Camilla, the Duchess of Cornwall, also spent an afternoon with Mural Arts to learn more about the program in 2007. If you are interested in learning more about the program and the murals, Jane Golden, the Executive Director of the Philly Mural Arts Program, wrote a book called Philadelphia Murals & the Stories They Tell. The book is available on Amazon, click here to check the price. There is also the sequel More Philadelphia Murals and the Stories They Tell, click here to check the price. It was inspiring to see the amazing artwork that is part of the Mural Mile and hear Brendan, our tour guide, explain the stories behind them. It was clear that Brendan was very knowledgeable and passionate about the murals and the artists. One of the things that struck me was the sheer size of the murals. Some were difficult to photograph because they were so gigantic. And as you would expect with street art, most were pretty bold and colorful. We saw so many amazing murals along the Philadelphia Mural Mile with moving stories to go along with them, I loved them all. Here are a few of the best murals in Philadelphia. 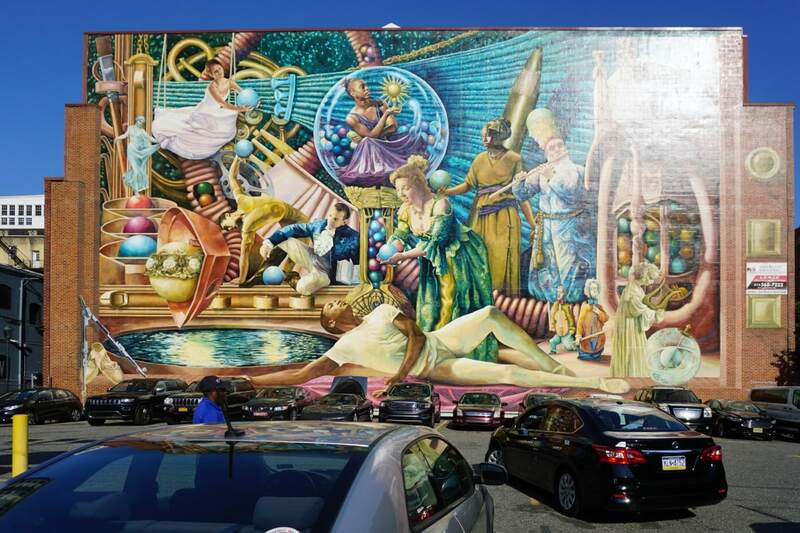 The art collective, Miss Rockaway Armada, worked with about 30 Mural Arts students aged 10 to 15 over the summer to create this colorful mural. It is a huge piece and there is lots going on so you will want to take some time to look at all the details. The artists had students draw an animal head on a sheet of paper, then fold it so no one could see it, and pass it to the next student to draw more, and so on. The goal was to show students that not everything has to end the way it began. I know sometimes it is hard to keep a positive attitude when things don’t look promising. I loved the message from this mural! How to Turn Anything Into Something Else has such a positive message! Visually, this mural by Isaac Lin is mesmerizing and it also covers two buildings! If you looked at the mural and the title, you might not guess it is about immigration! At first, it reminded me of a video game. He used colors of national flags to remind us that except for Native Americans, we all come from somewhere else as immigrants or refugees. The title comes from the idea of starting a new life, just as his parents did when they came to the United States. Start from here by Isaac Lin actually makes a statement about immigration. 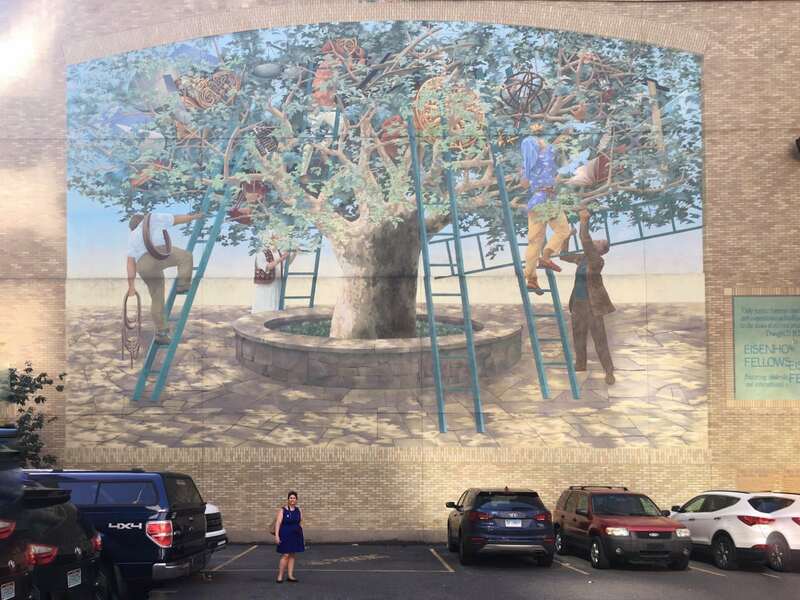 You can get a sense of the scale of the Tree of Knowledge mural. Do you see Anisa? And yes, all those bricks are painted on. 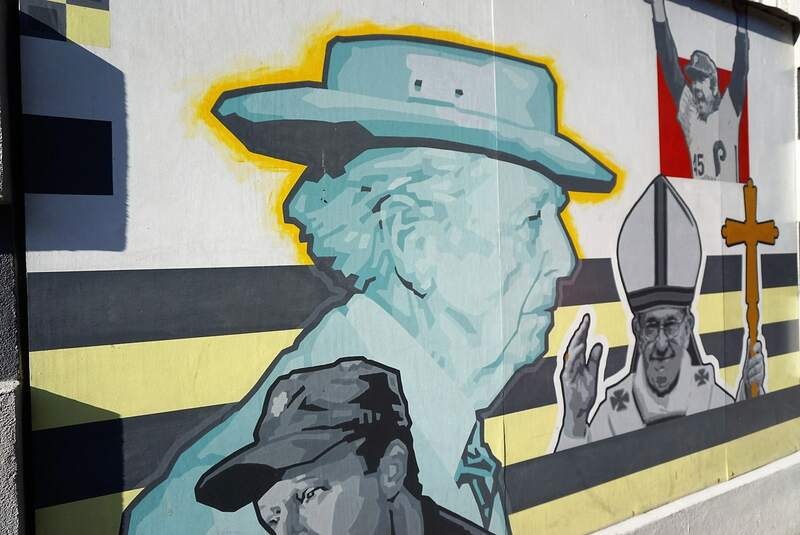 This mural by Michael Webb was created in honor of the 50 year anniversary of Eisenhower Fellowships. The organization identifies and connects innovative leaders committed to creating a better world that is more peaceful and prosperous. The Tree of Knowledge mural has objects hidden among the leaves that show what knowledge and perseverance can accomplish. You also see the ladders leading up the Tree of Knowledge. Since it is painted on the side of a building, I didn’t think much about the bricks I saw around the edge of the art. Then Brendan pointed out that the bricks were actually painted on. This technique of painting the bricks on is called Trompe-l’oeil, which means to deceive the eye. The artist makes the viewer believe that something painted on is actually a 3D physical object. I had to get close to verify it because the bricks looked so real. After learning about the technique, I noticed that several of the murals we saw had painted on bricks. This is a huge (2,200 square feet) multimedia mural led by artists Kathryn Pennepacker and Josh Sarantitis in partnership with Project H.O.M.E. and the City of Philadelphia Department of Health and Intellectual Disability Services. The artwork aimed to give a voice to Philadelphia’s homeless, reduce the stigma around homelessness, and to raise awareness about the issue in our society. The mural is so big, we weren’t able to capture it all in one photo! 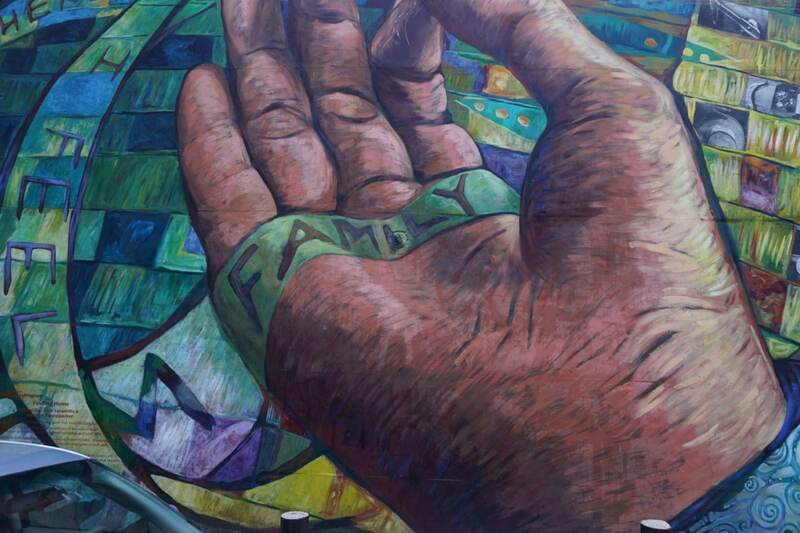 A closeup of part of the Finding Home mural. More detail on the Finding Home mural. Contributors, many who were homeless, wove strips of cloth depicting personal reflections on what it means to have a home. They adhered those strips to the wall and then painted. The artists also added pieces of print, sheet metal and cable into the mural. There were so many stories on this mural, I wish I would have had time to look at all of them. This mural by Cesar E Viveros-Herrera & Larissa Preston includes over 44 symbolic images representing diverse communities of women, the different roles they have played over time, and the complex obstacles they’ve overcome. The masks worn by some of the women represent the social issues women have faced (and continue to face) in their fight towards equality. Women of Progress by Cesar E Viveros-Herrera & Larissa Preston. Perfect mural for the outside of a bar named Dirty Franks! Dirty Franks is actually a bar in Philadelphia and instead of posting their name on the outside, they have a mural by the artist David McShane of different Franks on the walls. We had fun trying to guess the famous Franks depicted in the mural. They were creative and didn’t just include people with the first name Frank. For example, since the bar is in Philadelphia, they had to include Ben Franklin! I also like that they recently added Pope Francis, just in time for his visit to Philly. I could go on and on about the street art in Philly. We saw so many impressive murals. Check out our video for more insight on our Philly mural tour. Even in the video, it is hard to get a sense of the scale of the murals, they are huge! This Philadelphia street art tour starts at the Academy of Fine Arts Hamilton Building, 128 N. Broad Street. We checked in with reception and received buttons to wear. There are no breaks during the Mural Mile tour, so you will want to use the facilities and grab a drink before it starts. Everyone was ready a few minutes before the tour’s scheduled start time so our tour guide, Brendan, gathered the group and we headed off on our mural arts tour. 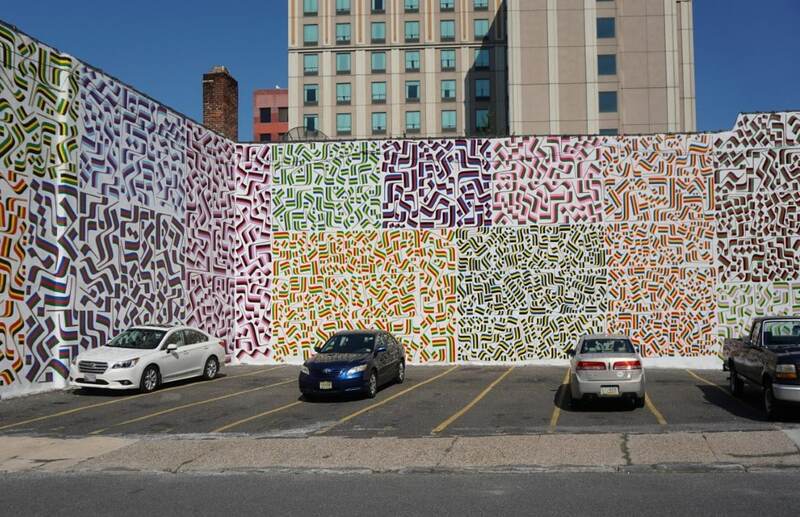 The Philadelphia mural arts tour ends close to the intersection of 12th Street and Locust. Brendan offered to direct anyone back to the starting point. We just walked to the 11th street subway stop which was about five minutes away. The tours operate rain or shine, so check the weather and come prepared. The day we had our Philadelphia Mural tour it was hot, but we still had a great time. The Mural Mile tour is definitely more than one mile long! According to my Fitbit, it is probably closer to two miles over the two-hour tour. For those with mobility issues, there is also the option to do a trolley tour. You can find the schedule for the different tours that are offered here. Tickets should be booked online for $22 per person or the Mural Mile tour. If you would like to do a self-guided tour of the murals, you can use this map to help locate the artwork. We enjoyed our tour of the Mural Mile in Philadelphia. Thanks so much to our tour guide Brendan! He had so much positive energy and knew his stuff. We covered a lot more ground than I expected and got to see so many breathtaking murals. Still, the stories behind the art are what will stick with me. I don’t think the street art would have had the same impact if we would have done a self-guided tour. The street art in Philadelphia is definitely a must-see whether you go on a tour like we did or see it on your own. 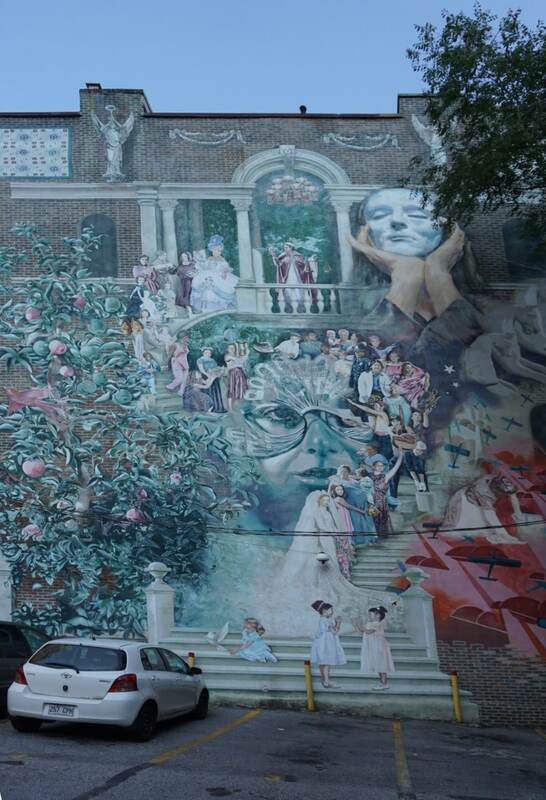 Philly has been called the “City of Murals” for good reason! 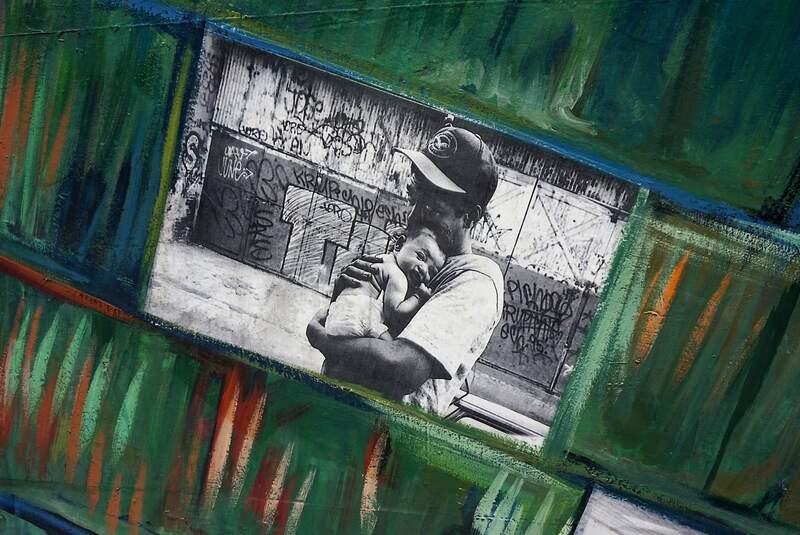 Has street art inspired you? Come prepared for the weather and lots of walking. Wear comfortable shoes and bring appropriate weather gear – i.e. umbrella, jacket, sunglasses. Check in with reception a few minutes before the tour, once everyone arrives they will start. Disclosure: No financial compensation was received. Thanks to Mural Arts Philadelphia for providing complimentary tours, so that we could share our experience with our readers. As always, opinions expressed here are my own. Beautiful article. We had a similar movement in Oakland, CA where artists would collaborate and create these beautiful murals to cover up the graffiti on buildings in made the city look great and deterred other graffiti artists from tagging. Thanks Lindsey. That sounds great, I will have to look into it more the next time I am in the bay area. WOW! This is amazing. Definitely adding Philadelphia to my Chasing Mural itinerary. Thank you for posting. Riselle – Thank you. So glad you enjoyed the post! Murals make cities look more lively and interesting. Love them! Jemma – Yes, I agree. I just love street art. I love street art and murals! Loved all this public art and definitely need to check out Philly for my next east coast trip. These are incredible. It’s been so many years since I went to Philly. Must certainly take a trip back. I’m sure there’s so much to see and do here now. Kellyn – Thank you. Yes you do need to get back to Philly! There is lots to see in addition to the street art. I was just blown away by the scale, colours and artwork! One of my favourite things about street art is how they often have an overt sociopolitical message, like the ones you highlighted about immigration and women’s rights. It’s so easy to go about our day-to-day lives without thinking about these issues, but with them literally staring you in the face, it’s a great way to force you to think about it! Plus, it’s great that the project has done so much to help disadvantaged communities – I wonder how they do that since they don’t charge for the tours? Michelle – Yes, the artwork is just amazing. And I agree there s lots of artwork that has a message but many times you wouldn’t even know without someone explaining it to you. The walking tour is $22 per person, we got ours complimentary in exchange for writing the post. I will make that more clear in the post. I’ve only ever visited Liberty Bell in Philadelphia on a passing trip! I never knew the city had such beautiful murals. The Garden of Delight is my favourite I think. Jen – I really enjoyed the Liberty Bell too! There really is a lot to see in Philadelphia. The Garden of Delight is really a pretty mural! Margarita – Thanks so much! Yes I loved the Muses too. So bold and so big! This is definitely a different side of Phili I had not known about other than cheesesteaks! I just love that street art is really bringing to life in streets around the world and celebrating creativity! Thanks for the intro to Philli! Julia – Yeah Philadelphia is not the first place you think of for street art but they do really have some impressive murals. I hope you get to visit! I had no idea about the street art mag mile in Philly! I love the art pieces that look 3D – I had to do a double take on some of your photos to make sure they are actually just 2D paintings on the wall and not actually 3D. And most of all I love that it is all for a good cause and they are helping locals in need in their community. Diana – Yes it is really deceiving that some parts of the paintings are so realistic! And yeah, I really love all the good this artwork is doing. What awesome murals! I love checking out the street art when I’m in a new place 🙂 And these are right up there with some of the best. I’m going to have to get to the east coast sooner rather than later! Kat – So glad you liked them. I hope you make it to Philly too. There really is a lot to see, not just the street art. Upeksha – Thank you! Yes, I was really impressed by the murals too and even more impressed with the stories behind them. Thanks, so glad you enjoyed it. The street art really was impressive! Laryssa – Yeah, I was pleasantly surprised too. I hope you get the chance to explore the art. Hilary – Yes, I knew you would love it. I really like the Start from Here one too! Ruth – There really is so much to see in Philadelphia these days so it’s understandable. I hope you get the chance to go back. Yes! I’ve seen some of these but really want to do the whole thing. Awesome pictures. Sarah – Yes, you would love the tour. I want to go back and see more too. I remember seeing many murals in Philadelphia years ago when I visited and was blown away by their sheer size and the message behind it. But I loved this piece and learning more about the project! Stephanie – Thanks so much, so glad to hear you enjoyed it. Yes, I couldn’t get over the size either and I just loved hearing about the Mural Arts Program. Yes Philadelphia is definitely worth a visit. The street art is amazing and there really is so much history there! When we were in Philly a few years ago there was some great street art that we saw then. I love that they are really making this a big thing. I love how diverse the types of art there is. This sounds like a cool tour that would really get your creative juices flowing! Jessica – Yes it’s a great tour. I hope you get the chance to go back, they have so many new murals now. I’m so embarrassed to admit that despite having lived in Manhattan for a couple years, I’ve never been to Philly! And now I want to go there for more reasons than one (Philly cheesesteaks, obviously)—who knew it was such a vibrant city full of creatives?! Kristin – You really should go and it’s easy to take the Megabus from NYC. There is so much to do – the street art, the history, cheesesteak, and other museums. I have written a few posts on it, and have more to write. I love street art and if I’m ever in Philadelphia I will definitely take a the tour. Great photos! Theresa – Thank you. So glad you enjoyed the post and I hope you get to do the tour. What a brilliant idea for an organisation! I also really love some of the pieces, street art is one of my favourites. Would have loved to take this tour! Also like that you included the story behind the pieces. Helena – Yes, I just really love the mission of Mural Arts and I am so inspired by the work that they have done. I hope you get the chance to take the tour. This street art is amazing! I had no idea that Philedelphia had such amazing artists. Thanks for sharing! Jean – Thanks, so glad you enjoyed the post. This is an amazing post! Finding local street art is one of my absolute favorite things to do while traveling. I’ve never been to Philadelphia, but this is something I’d most definitely want to do if I ever make it there. Thanks for sharing! Kristen – Thanks so much for the kind words, so glad you enjoyed the post. I hope you do get to visit Philadelphia. Not only is it great for street art, but there is so much history and great museums. Cheryl – I hope you guys make it to Philly to see them for yourselves. I really like the stories behind them too. I’m a mural and street art addict…just love seeing this amazing art form as part of the landscape. Really enjoyed your post! Diana – So glad you enjoyed the post and I hope you get a chance to see the murals for yourself. Janine – If you love street art, you will definitely love this tour! We love street art tours, and this one looks great! The Issac Lin piece on immigration looks so intriguing. We’ll definitely check out the tour when we visit Philly someday! Eulanda – It really was an excellent tour. I loved the Isaac Lin piece too. I thought it was mesmerizing and loved the message behind it. Oh l love this! I especially love the Garden of Delight!! Will have to keep this in mind for a future trip to Philadelphia! #TheWeeklyPostcard! Lolo – Yes the Garden of Delight is a pretty one. I hope you get the chance to do the tour. Kat – Thanks. The murals are really spectacular and so inspiring. Thanks Jessica, so glad you liked the art. I hope you do get back to Philly to see it for yourself. Over 4,000 pieces is a lot!! Street art is something I’ve recently come to enjoy a lot. It’s such a great way to get to know a city. This one in Philadelphia looks really fun to explore. Hopefully we find ourselves there someday to enjoy it too. Great pictures! Edith – Thank you! Yes, it is a pretty impressive collection. I hope you get the chance to see it for yourself. Anda – Thanks so much. It really was a great tour. You know I think I miss a lot of the street art too, which is one of the reasons I have started doing tours. You see more and I really like hearing the story behind the art. Philadelphia has changed so much since I lived there. I saw a bit of street art when I visited last summer, but street art really has become popular! They have such talented artists. Stephanie – Yes, I was really impressed with the street art there! Wow, I love that this tour gives you the stories behind the mural. I have always loved this kind of art, but often without the backstory you never understand it. So impactful! Thanks for sharing! Missy – You are welcome. It is so true, you really miss out a lot if you don’t hear the backstory. Yes, it really is a great project. I hope you get to do the tour next time you are there. I can’t believe I didn’t know about this! What a fantastic program. I can’t wait to check it out when I visit family there. Thanks for including such comprehensive logistics. Yvette – So glad you found the post helpful. I am sure you will love the tour. I am a big fan of urban art and am willing to travel anywhere to see them. The Philadelphia Mural Mile looks exotic. The murals are also expressive and colorful. Would love to see this one day. Soumya – You would love this tour! Definitely add it to your list.